Watch Pretty Little Liars Season 7 full episodes online, free and paid options via our partners and affiliates. On Pretty Little Liars Season 7 Episode 20, the liars finally found out the truth about who was tormenting them all this time. Who was it? On Pretty Little Liars Season 7 Episode 19, new information is discovered about Charlotte's death, while the Liars believes they know A.D.'s identity. On Pretty Little Liars Season 7 Episode 18, the liars are forced to go separate ways to find out the truth. On Pretty Little Liars Season 7 Episode 17, Aria and Ezra try to find a way to make their relationship right. "The Glove That Rocks the Cradle"
On Pretty Little Liars Season 7 Episode 16, Hanna must come to terms with Lucas possible connection to A.D, while the Liars team up to protect one of their own. "In the Eye Abides the Heart"
On Pretty Little Liars Season 7 Episode 15, one of the liars ends up on the dark side to protect those she cares about when she is blackmailed by A.D.
On Pretty Little Liars Season 7 Episode 14, Aria takes her turn at the game and gets to meet Uber A in the process, but who is it? On Pretty Little Liars Season 7 Episode 13, there will be much tension when Hanna takes her turn at the game, but how far does A go? "These Boots Were Made for Stalking"
On Pretty Little Liars Season 7 Episode 11, the girls react to the news that Spencer is Mary Drake's daughter, while Uber A goes rogue. On Pretty Little Liars Season 7 Episode 10, one person' past could change everything while the ladies face off in a chaotic fight that ends with a fatality. On Pretty Little Liars Season 7 Episode 9, one of the liars goes rogue in order to prove Noel Kahn is A, but what does Marco have to say about it all? On Pretty Little Liars Season 7 Episode 8, Paige returns to Rosewood, but is Emily happy to see her ex-girlfriend, or are they on the outs? On Pretty Little Liars Season 7 Episode 7, Jason returns to town and goes all-out in order to get rid of Mary Drake, but what does he really know about her? On Pretty Little Liars Season 7 Episode 6, the liars realize the error of their ways and that they must come clean to Rosewood P.D about the murder. On Pretty Little Liars Season 7 Episode 5, Jenna becomes the Liars' number one suspect for Uber A when she befriends another one of their enemies. "Hit and Run, Run, Run"
On Pretty Little Liars Season 7 Episode 4, the liars face the aftermath of their biggest secret yet, while Jenna returns to town, and Spencer falls apart. On Pretty Little Liars Season 7 Episode 3, while still reeling from Hanna's abduction, the Liars jump into action to rescue one of their own. On Pretty Little Liars Season 7 Episode 2, Hanna tries to make sense of Mary Drake's true motives, while A steps up their reign of terror. On Pretty Little Liars Season 7 Episode 1, the liars must have their wits about them in order to save Hannah from Mary and Elliot, but will they succeed? Pretty Little Liars Round Table: Was The Reveal a Dud? 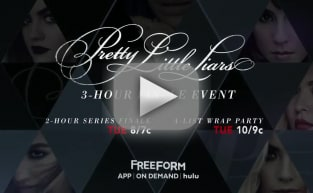 Pretty Little Liars Series Finale Promo: A.D. Is Revealed! Pretty Little Liars Promo: Aria Is Caught Working for A! Pretty Little Liars Promo: Who Gets Engaged?! ?